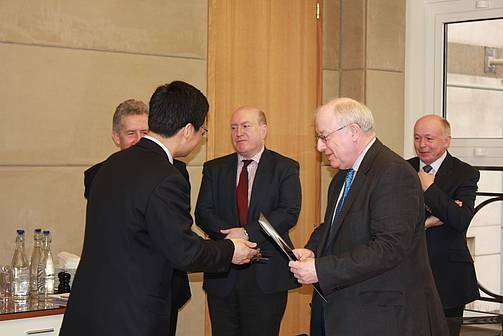 A delegation from Xiamen, China accompanied by the CEO of COSCO UK visit the London offices of Thomas Miller. The purpose of the visit by the delegation was to understand more of the shipping/insurance sectors in London and to foster good relations. The six-person Xiamen delegation was headed by its Vice Major, Mr Kang Tao together with Simon Yang (Shicheng), the CEO of COSCO UK. Xiamen is the second largest city in the Fujian province of China with a population of 4 million, and is the eighth largest container port in China and eighteenth in the world. The port has traditional cargo handling facilities in addition to its container terminals and has been making rapid development year-on-year. The delegation was greeted by Hugo Wynn-Williams CEO of Thomas Miller P&I and also by others in Thomas Miller. Presentations on the P&I Club, the TT Club and Thomas Miller were made by Dr Chao Wu, Paul Wicks and John McPhail. Following the visit to the Thomas Miller offices, a tour of Lloyd’s Building was arranged through Miller Insurance. The delegation was looked after by Philip Bennett.